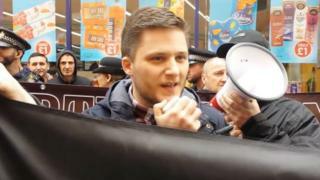 A man accused of being in a banned neo-Nazi group has told a court he was joking when he said "your enemy is the Jew" during a city centre speech. Andrew Clarke, of Prescot, Merseyside, denies membership of National Action. The Old Bailey heard Mr Clarke had also told Jewish MP Luciana Berger to "hurry up and die" in a social media post. Michal Trubini, 36, of Warrington, Cheshire, and Jack Renshaw, 23, of Skelmersdale, Lancashire, also deny membership of National Action. The group was proscribed under anti-terror laws in December 2016. Jurors were shown the text of a speech given by 34-year-old Mr Clarke in St Helens days before proscription. It said there was an attempt to "infiltrate towns and cities with hordes of non-white trash" and that "these people are brought here by Jewish subversive vermin". Mr Clarke also accused several Jewish MPs of seeking to "flood Merseyside with non-white subhuman scum". Giving evidence, he told jurors he "didn't care what I was saying" and had deliberately included inaccurate information to see if it would be reported by the media. Prosecutor Duncan Atkinson QC asked Mr Clarke if he thought this would make the media look silly rather than himself. Mr Clarke said National Action's humour was "lost" on people. When asked if he had been joking when he declared "St Helens your enemy is the Jew", Mr Clarke replied "it was a joke". The jury was shown a post-ban Facebook post allegedly showing Mr Clarke responding to an image of MP Luciana Berger by writing "Hurry and die. Lots of hate. National Action". Mr Atkinson asked: "Did you consider she should hurry up and die?" Mr Clarke denied he had posted the comments, saying "they aren't my words". "It has your name on it," the prosecutor replied, adding "it expresses your view of people like her".